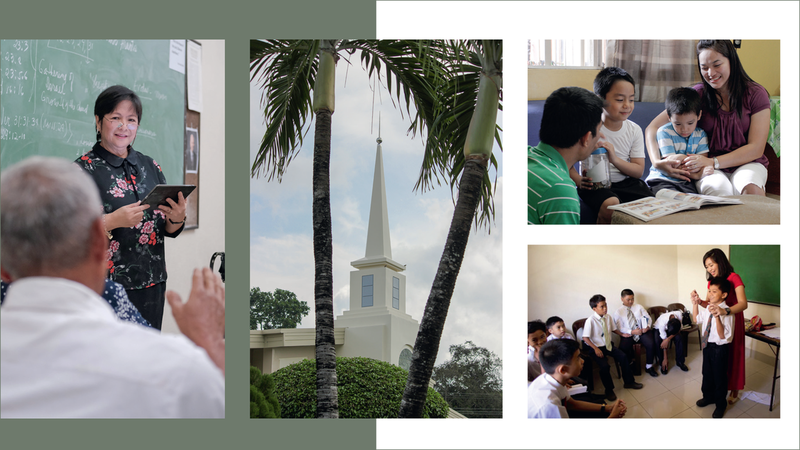 This year begins in the Philippines with a highlight--the visit by a member of the Quorum of the Twelve Apostles, Elder Jeffery R. Holland and the groundbreaking for the Urdaneta Temple, on January 16th, eight years after it was announced. The visit and the groundbreaking are both representations that God loves the Philippines and her people and that He is accelerating His work on both sides of the veil. At this time of the year, many set goals and resolutions. Many begin making plans and find energy seeing January as a new beginning. Some make a fresh start reflecting on what to stop doing, perhaps putting off the “old man” and putting on the “new man” even “putting on Christ.” (Ephesians 4:22,24; Gal 3:27). Some make a fresh start by making or renewing commitments to, for instance be baptized, return to church, serve missions, be sealed in the temple, receive the authority of the priesthood, seek further education, become self reliant, go to the temple once a week or once a month or once a year, complete four generations of family history or the next four generations, or keep a specific commandment. Hopefully whatever our resolutions, with the counsel of prophets, seers, and revelators, individually and as families we will become closer to the Savior Jesus Christ who is “the beginning and the end” (Revelation 21:6; Doctrine and Covenants 19:1). As we contemplate the adjustments to ministering, to home-centered and Church-supported gospel learning and living, don’t we often feel like beginners? And if we aren’t beginners maybe we are fresh starters recommitting ourselves to try again. Such feelings normally come to me after each general conference. I commit myself to make a fresh start to follow God’s prophet. In the October 2018 general conference, President Russell M. Nelson stated: “In recent years, we in the presiding councils of the Church have wrestled with a fundamental question: how can we take the gospel in its simple purity and the ordinances with their eternal efficacy to all of God’s children?’ It is time for a home-centered Church supported by what takes place inside branch, ward and stake buildings. As we heard in general conference, this year is the beginning of the new Sunday schedule. We know it is not the number of hours we spend at Church that counts. It is how we spend our time as families and individuals during and after the two hours that matters. A good reminder to all of us is a counsel given to Newel K. Whitney to “set in order his family and see that they are more diligent and concerned at home and pray always” (Doctrine and Covenants 93:50). One way to respond to that counsel is to pray in our families that our wives and our children may be blessed (see 3 Nephi 18:21). Recent revelation and announcements reinforce that “parents have a sacred duty to rear their children in love and righteousness, to provide for their physical and spiritual needs, and to teach them to love and serve one another, to observe the commandments of God” (“The Family: A Proclamation to the World”). Please understand that when “family” is used in this article or in the scriptures, it means a husband and wife, children, and sometimes other relatives living in the same house. It also means a single parent with children, a husband and wife without children, or a single person living alone or with roommates (see Guide to the Scriptures, “Family”). The Lord explained best: “I will be the God of all the families of Israel and they shall be my people.” (Jeremiah 31:1). These are some of the miracles that happen when families “talk of Christ” in the home so “that our children may know to what source they may look for a remission of their sins” (2 Nephi 25:26). This is what home-centered, Church-supported living will look like. We meet the challenges of life optimistically, as well as the successes and the miracles through the consistency of holy habits in the home—habits that are supported at Church. We work on these holy habits as beginners or fresh starters. I invite all of us to commit and recommit. Now is the time and only we can focus our lives on the Savior through home-centered and Church-supported gospel learning and living.